To manufacture this precision tolerance stainless steel spring, Maverick Spring Makers Limited had to solve several problems. 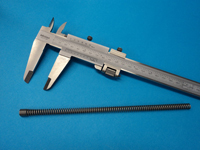 The spring featured over 80 active coils and required a free length tolerance of less than +/- 0.5 mm. Additionally, the inside diameter tolerance was so restricted that any cut-off burr would be unacceptable. Maverick Spring Makers came up with an innovative solution, and developed a system to vary the number of closed coils, to make sure that each spring conformed to an exact length. A proprietary system for burr-free cut off was designed and implemented, overcoming the restrictions of the inside diameter tolerance. The spring was manufactured using a customized fully automated machine center, including coiling, low-temperature heat treatment, set-removal, and packaging. Customer supplied reusable totes were automatically packed, 1000 pieces per tote. As required, Maverick Spring Makers Limited achieved 100% on-time delivery for the life of the programme. The process performance, as indicated by a Cpk (process capability index), was well above requirements, with single-digit internal ppm (parts per million), and Zero external ppm indicating a very low incidence of defects. Upon completion, the steel parking brake spring featured 80 active coils, between 5 and 10 inactive coils, and the inside diameter measured 4.75 - 4.90 mm, which was accommodated by our proprietary burr-free cut off system. 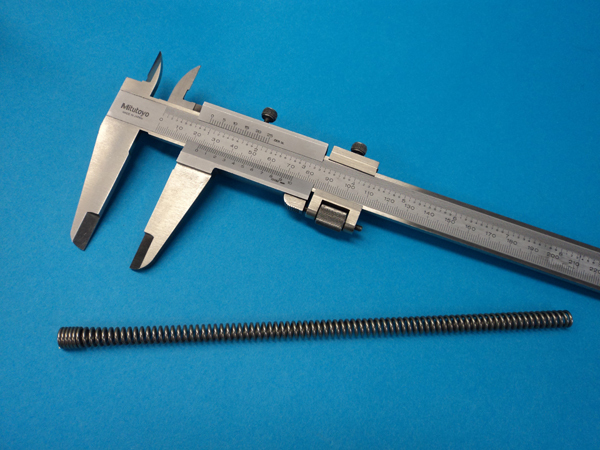 The free length of the spring was 219 mm +/- .05mm. To learn more about this project or to inquire about other services, please contact Maverick Spring Makers.